Blossom Deli, Charleston WV (CLOSED) – Marie, Let's Eat! Well, here’s an interesting turn-up for our blog. This is the first time that I’ve written anything about a restaurant which has apparently changed dramatically since we actually visited it. In fact, when I decided back in October to do these honeymoon flashback chapters, I realized that I would unfortunately be writing a little obituary for Blossom Deli in Charleston, but that only lasted a couple of weeks before word got out that the place would be reopening under new ownership. In December, Blossom reopened to a lot of goodwill, best wishes and crossed fingers. This is a restaurant with a very curious and fun history. Apparently, the original Blossom Dairy was started in the 1920s by one Samuel Sloman. He eventually branched out to old-fashioned lunch counters, and there were somewhere between six and ten of them in the region. It’s one of these stores, opened in 1938, that is still with us, although no longer in family hands and after several periods of closure and neglect. It’s in downtown Charleston on Quarrier Street, and the original version apparently stuck around for at least fifteen years – Mr. Sloman passed away in 1953 – but eventually shuttered and lay dormant for years. 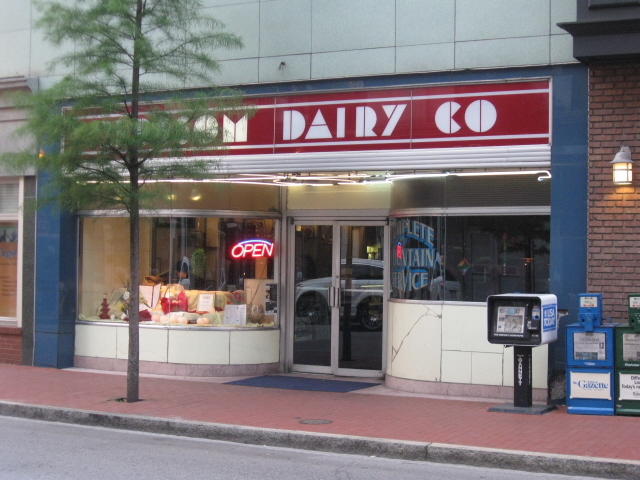 I’ve found conflicting reports as to exactly when the original Blossom Dairy closed, and for how long this period of closure lasted, so take what you hear with a grain of salt. I’ve even heard tell that at some point in the eighties, the building was an all-ages punk club. I’ll tell you what’s really neat to think about. You know the Nero Wolfe adventure Too Many Cooks? Well, possibly not. Anyway, the action takes place at a fictionalized version of the exclusive West Virginia retreat Kanawha Spa. If we can imagine that Archie Goodwin would have been asked by the state’s attorney’s office to return to Charleston to give evidence in the capital murder case that would have followed the events of that story, then it stands to reason that Archie would have gone somewhere for a corned beef sandwich and two glasses of milk. I didn’t actually enjoy that particular novel, finding it dated and Wolfe’s views on race patronizing, but I liked it a lot more when I realized that, having never been to Manhattan, the Blossom Dairy is the first place I’ve visited that Archie Goodwin might have also been. And it looks much the same as it would have back then. At any rate, after however long a period of closure, the Blossom reopened, now called Blossom Deli but retaining the original signage. Changing the sign would have been a crime against cuisine, fashion, design and history, anyway. Just look at that awesome art deco block lettering and all that red and the entryway’s beautiful curves. If that doesn’t make you want to put on a wartime-era suit and hat to go in for a milkshake, you probably need to put down the cell phone and quit texting teenagers, kid. Under the more modern management, Blossom Deli turned into a restaurant so impressive that I described it as being what Marietta Diner wants to be when it grows up. It had evolved into what’s a said-to-be-awesome sandwich shop in the daytime, and then at night, they turn the lights down and pull out the tablecloths and have a very upscale supper menu in place. At all times, they serve fabulous desserts. Marie had a chocolate mousse that was so rich and amazing that even she couldn’t finish it, but she retired it with a big smile on her face. We stopped in about a half hour after finishing supper several blocks away at Bluegrass Kitchen. I don’t suppose there’s any tactful way to tell somebody that you’re going to pass on their dessert and go get a sweet treat someplace else, but when the goal is to visit several places in a community, that’s what you need to do. Blossom is about a block-and-a-half from a really super independent bookstore called Taylor Books, which has been hanging on and serving its community during this tough recession and the general battering that indie sellers have taken over the last few years. We left town very impressed, and while our hearts would later be stolen by Asheville, we certainly saw downtown Charleston as a place where we could be very happy. When you add in the delightful conversation that we had at Bluegrass Kitchen, it looked like a really fantastic community, and that’s why I got genuinely upset, doing a little research into the restaurants that we visited, to find the team at Fork You writing, in September, about Blossom Deli’s impending demise. Since then, I’ve been following the story as new links have emerged. Here are three news stories about Blossom – apparently, for legal reasons, no longer “Dairy” nor “Deli” – and its latest incarnation, which opened on December 2nd. (One, Two, and Three.) The new ownership team of Jay Cipoletti, Mark Hartling and James Nester, with chef Matthew Grover, have inherited a lot of goodwill and a lot of hope. They are presently open only for lunch, their upscale supper plans on hold until they find their feet a little better. We may be seven hours away and unlikely to return anytime soon, but I certainly wish them the best, and a long and successful career in that awesome building. Posted on January 1, 2011 July 29, 2017 by Grant G.Posted in casual american, dessert, honeymoon flashbackTagged casual american, dessert, ice cream, west virginia. Pingback: Henderson’s, Thomasville GA – Marie, Let's Eat!